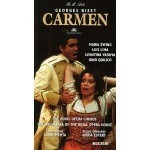 This Carmen may not quite be definitive, but it’s still been very popular over the years and justly so. The rough tan brick sets are handsome and the costumes strike a good balance between appealing color and working-class realism. 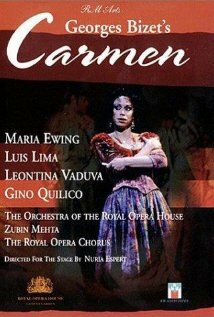 Apart from some showy flamenco dancing in Act II, this is very much a Carmen driven by its plot and its characters, not by exoticism or spectacle. The staging by Spanish actress Nuria Espert is, apart from a few cluttered crowd scenes, lively and intelligent throughout. 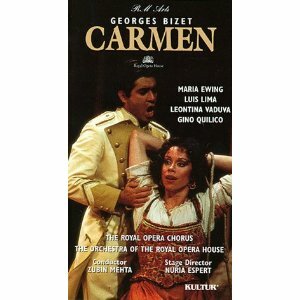 The production is traditional, yet with several inventive touches: Don José doesn’t stab Carmen with a knife in the end, but impales her with a hook from the bullring, whether for symbolism or just for startling, visceral effect I don’t know. But what really make this performance stand out in the catalogue are the lead singers’ performances, especially their acting. 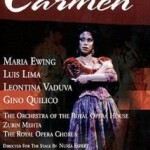 While not perfect, this Carmen still has plenty of charms and compelling drama to offer, and is high on my list of recommendations.